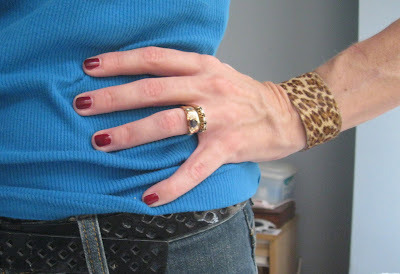 Leopard cuff by LaCrasia, the glove makers, from their tiny shop at Grand Central in NYC. Essie polish in Berry Hard. I never thought I’d say this, but I’m mildly worried about the oversaturation of leopard for fall and winter this year. It is pretty much everywhere in the stores, in every incarnation, and even though I love leopard, and never get tired of it (I think), I will probably just add it to my wardrobe in little pops, especially against blue and purple. Leopard belt from J. Crew. Leopard silk scarf from Ross Dress for Less, bought over 15 years ago and the best $10 I ever spent on an accessory. YSL Tribute tote in Aubergine patent. J. Crew cardigan with tie-neck blouse from Kohl’s. One exception is this J. Crew cardigan I bought last year. The colors are a different take on traditional leopard print, which is one of the reasons I love it. What about you? Are you going for it with the leopard this year? I am mixing it in with everything and searching for the perfect affordable leopard booties. I think they are pushing it too hard however, just like the polka dot, taking a classic print and creating burn out. My goal is to mix leopard with plaid and make it work. I agree with you, Jill, it is close to oversaturation! I have three pair of leopard shoes (from over years) and tops and scraves and now I have rested temptation to purchase a leopard purse. I love it also...and I do not want to tire of it! I also love your cardigan and the bracelet in the first picture. One think is for sure...animal prints never really go away!! I hope this doesn't upset anyone, but one thing I am absolutely tired of is the Missoni Zig Zag Target Collection...I am so glad that I was at work that day! That cardigan is delightful--the pattern is really distinct from all the other leopard out there. And the pussybow shirt. Puuuurrrrrrfect! 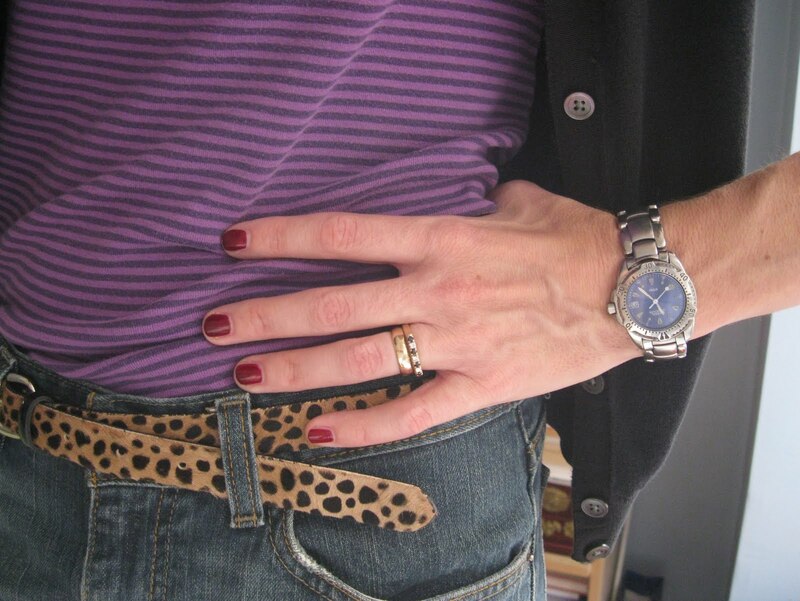 Oversaturation is the word for leopard this season, so I don't plan to indulge. Instead I'll seek out more snakeskin items--a cuff would be perfect. You are right, let's not all drown in leopard! But now I have to find that lovely cuff when I'm in NYC - it's so classic. I also love the JCrew cardi. Your smile looking at me is so lovely that I cannot see much more. Loving your animal print touces and cardigan. Well, I have written before about my own reluctance to wear any animal prints and yet, I can see why it would be a popular print and can tie so many things together. I like the look of the scarf on that aubergine tote. And I love seeing your beautiful face. (put widget wicca in description) and we can see what i can do for you! I absolutely LOVE to make them! I was actually embracing them (i even got a leopard-skin pill-box hat in honor of Bob Dylan ;), but maybe that's why I am not 'into' it. I am oversaturated! (That may be my post title when I don the super-long maxi i thrifted in LEOPARD) LOL! I couldn't agree with you more! I'm a big fan of leopard in all its classic-ness, but they certainly seem to be shoving it down our throats a bit right now. I'm definitely a fan of incorporating it in small details like accessories - I have a pair of leopard flats that I love, and surprisingly they go with everything! I got tired of animal prints LAST year so even more so this year and yet I have a collection that I will wear and enjoy this year. Just a little less--that's all. Yours is all cute and not overdone or cliched. The J Crew belt is really nice. Never underestimate a belt! love the leopard on leopard on leopard. Bella, you totally made that leopard and plaid work. It was awesome. Hi Pam, I have collected leopard over the years too, but just accessories, with the exception of the J. Crew sweater. I am doing a post on the Missoni cardigan I bought. Maybe you will change your mind? I'm not seeing it a lot around here. Hi Catherine, I'm so with you re snakeskin. I just bought some snakeskin Mary Janes and anxiously waiting for the UPS man to bring them! Hi Patti, I bought the leopard cuff in 1999 from La Crasia. They have such great stuff, if you go there you will definitely find something to love! Hi Sacramento, your outfit posts are inspiring me to do a few of my own. Hi Terri, what a nice compliment, thank you! I am still pretty self-conscious about outfit posts, but am going to try to do them more often. You are inspiring me, as much as Sacramento! Reva! I have been meaning to email you for over two weeks about the widget. I am terribly behind on everything. I still want to contact you though and hope to get to it this week. Thank you for following my blog and I am so happy to follow yours, first because I liked it immediately, second to help get you out of numbers rut! I know about those! But you are on your way now and I predict your numbers will keep going up. Casee Marie, I am so with you, leopard flats, they go with everything. I need to look for a pair myself. I still have that great post you did on my brain, showing all those gorgeous bags paired with wonderful elegant fall clothes. Hi Paula, I hope you will be showing what leopard pieces you are incorporating into your fall wardrobe. I am sticking with my accessories, I just love a little pop of it. Hi Marina, I love leopard with bright vibrant colors too. As for the 'Pan Am' show, well, I'm hooked. I forgot how much I like Christina Ricci and some of the pilots are nice looking. Also, I am loving the costumes more and I am already crazy for the hair and makeup, all those great eyeshadows and cat eyeliner on the girls! Hi Paula, it's funny you mention camouflage, I cannot wear it at all. With my military upbringing I am absolutely allergic to it. I swear I would break out in hives if I wore camouflage of any kind. The only piece of a military uniform I adore and will never get tired of looking at is the pea coat worn by the U.S. Navy. I am lucky enough to have my father's Navy pea coat, circa 1964. It is a treasure. Hiya Audrey, thanks for stopping by!